OK guys, I am going to share a little secret with you...I am not a corn lover. You may be able to convince to indulge in a nice fresh corn on the cob slathered in salt and butter once in a great while, but if I find pesky corn kernels lurking in a dish, it is game over for me. 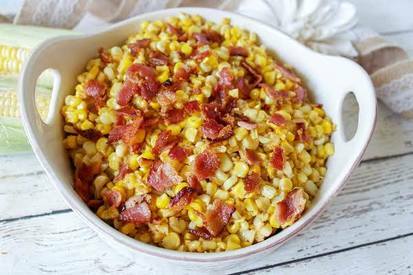 But, even I can get on board with this fried corn recipe with copious amount of BACON! Maybe Bacon really does make everything better?